A rice cooker is a specialized appliance that is used to cook rice perfectly, every time. Understanding how the rice cooker works and how to measure ingredients will yield better results. Rice cookers are sealed electric appliances. They are able to bring the water up to boil quickly and maintain a consistent temperature for the rice to cook. Additionally, since they are sealed, the air pressure is reduced and the liquid boils faster. A temperature monitor within the rice cooker monitors the temperature and can regulate the cooking once the water has boiled. Every rice cooker comes with a manual and very specific directions. It's essential to follow those directions, as cooking times vary by rice cooker. If you were to cook long grain white rice in a pot on a cooktop, it generally involves using a set amount of rice and slightly more water than rice (example: 2 cups raw rice plus 2-1/2 cups water). This is very standard and you can use the same measuring cup for both ingredients. However, if you use a rice cooker, measuring can get confusing. Many rice cookers come with a handy rice cup measure and product manuals will provide cooking guides based on these measurements. While a standard U.S. cup measure is 240 ml, a rice cup according to rice industry standards is much smaller at 180 ml. It can be helpful to use the rice cup that came with your rice cooker for measurement. If you use the smaller rice cup for measuring both rice and water, be sure to fill the water to the marked water line within the rice cooker. This will make sure you have enough water and account for the smaller rice cup. Feel free to use whatever you want to fill the rice cooker, as long as you hit the water line inside the rice cooker. If you are making the maximum rice possible in your cooker, using a standard U.S. measurement for rice and/or water, you will overload your rice cooker. A rice maker is a simple kitchen gadget that can streamline your cooking and help make a wide variety of rice and grains. For the best results from your rice cooker, it's wise to use the cup measurement that came with your cooker. A helpful tip is to store the smaller rice cup that came with your rice cooker inside your rice cooker. This will protect it from getting lost or mixed up with other standard measuring cups and reminds you to use the correct measure for making rice. 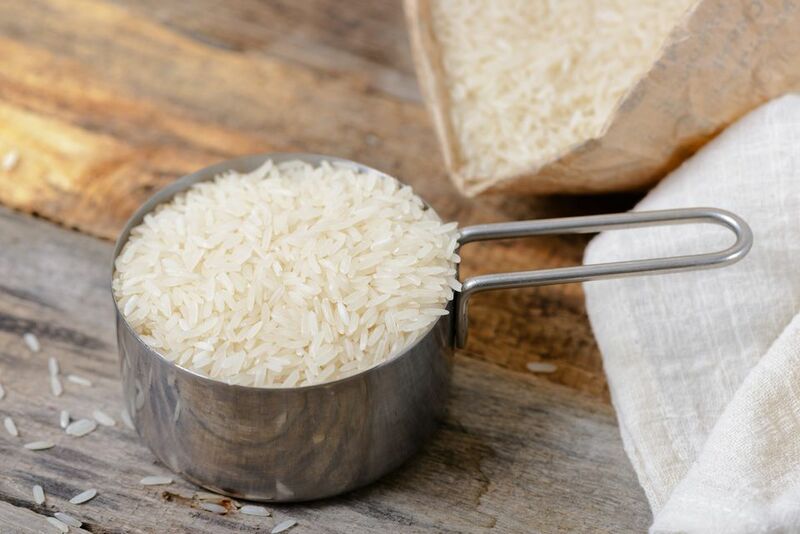 Once you feel comfortable cooking with your rice cooker, try experimenting with different styles of rice such as sticky rice, jasmine rice, basmati rice, sushi rice, brown rice, and more. Also, some rice cookers can be used to cook other grains such as steel cut oats, wheat berries, barley, or more. Be sure to read your rice cooker's manual for tips on cooking rice varieties and other grains. Many rice recipes will call for the rice to be rinsed in water prior to cooking. Be sure to measure the rice first, before rinsing. Then follow the rinsing directions for that specific type of rice—many recipes recommend quickly rinsing so the rice does not absorb water prior to cooking. How Many Cups of Cooked Rice Do Rice Cookers Produce? Is Ricing or Mashing Better for Making Mashed Potatoes?